How Do I Get Followers for My LinkedIn Company Page? Did you know that LinkedIn is rated as the No. 1 social network for lead generation? The great thing about LinkedIn is that it's a professional network with users that are business minded. It’s the obvious first choice that comes to mind for B2B companies who are utilizing social media marketing. To get valuable leads from LinkedIn, you’re first going to need to get followers for your LinkedIn Company Page. Here are seven tips to help you do just that. Just like you would for a blog post, website page, etc., it’s important to include relevant keywords in the description of your LinkedIn Company Page. Users can also search Company Pages within LinkedIn by keywords, so it’s important to include keywords and phrases that describe who your company is and what you do. You should also be doing this in the posts on your page (especially any long, content-heavy posts). Extra Tip: Make sure your company profile is completely filled out as LinkedIn will favor complete profiles during a search. So, if you’re missing anything, you may be left out of the search results. Are you engaging with your existing Company Page followers? One great way to engage with them is to ask thoughtful questions in your posts to encourage users to comment – just don’t forget to reply and engage with your followers once they do leave a comment. Actively interacting with those who engage with your content shows users that you're present on LinkedIn and care about what they have to say. There are more than one million groups on LinkedIn covering almost every industry. Most users in LinkedIn groups have joined because they’re interested in sharing content, making connections, and finding answers. By contributing your own insight into these groups, you can help your company establish an authoritative position. Contributing to discussions and sharing relevant content can attract members to engage with and follow your page. Not only should you contribute to an established discussion, but you should also post your own topics, ask questions, and engage with the audience in the group. Did you know that LinkedIn posts with images tend to get a 98% higher comment rate than posts without images? Sharing updates with rich media (like a photo or video) can really help your posts stand out in the news feed to increase visibility and user engagement. Canva is a great tool to easily create graphics to share in your posts (it is definitely one of my personal favorites). Because the typical LinkedIn user only utilizes the platform for an average of 17 minutes per month, you need to make sure you are putting out content that will attract their attention to your page and keep them wanting to come back for more. A quick and easy way to gain followers is by promoting your LinkedIn Company Page via your other social media marketing channels, such as Facebook, Twitter, and Instagram. You should also include a link or “follow” button to your LinkedIn Company Page on your company website (typically in the header or footer), blog posts, email signatures, promotional emails or updates, newsletters, etc. Your employees are the best place to start when trying to increase followers on your LinkedIn Company Page. After all, they’re the biggest advocates for your company! Encourage employees to add your company as their current place of employment on their personal profiles. By doing this, they will automatically become followers who can then engage with your Company Page’s content. Once they’ve become followers, ask your employees to engage with your page’s content by leaving comments and sharing posts/updates from your Company Page for maximum visibility. In addition to your employees, many of your clients and business partners probably have a LinkedIn Company Page that you could follow to encourage a follow-back. A cover image is located at the top of your LinkedIn Company Page. This image should reflect some aspect of your company that will capture visitors' attention and encourage them to explore your page. It’s useful to include a strong value proposition in your cover image to give a brief description of your company. If your business lacks its own graphics department, consider again testing out Canva or other easy-to-use design sites to create an awesome graphic for your cover photo. Consumers and businesses alike are increasingly becoming more interested in connecting with other companies and brands who provide insightful content and useful information. 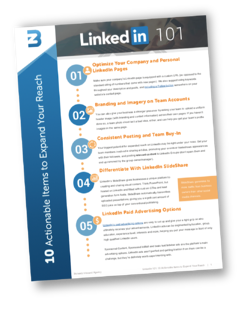 Marketing on LinkedIn provides the ideal platform to build these beneficial relationships – all you need to do is utilize the above tips to start gaining more followers! Editor’s Note: This post was originally published in February 2015. It was updated in September 2018 for accuracy and comprehensiveness. Want More Leads From LinkedIn?